But, I frequently get the female adapters (both grey gas and black beer) stuck on the posts. I can usually get them off but only with a whole lot of force. I had always thought the "in" and "out" were only to keep the dip tube straight from the gas inlet. But, my LHBS owner let me know that the posts are different too. Problem is he wasn't exactly sure how to tell. Can someone help? Sorry if the terminology is confusing. The gas posts have horizontal cuts in the points where the wrench goes on. 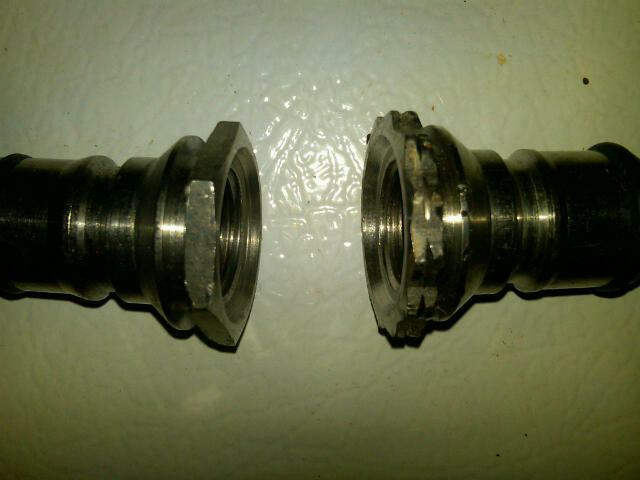 Here's a pic, the gas post is on the right, liquid is on the left. I've been having this problem lately too, but only the gas post on one of my kegs. Started happening a few months ago, the keg was fine until then. It was a frustrating mystery until last night when I noticed that the O-ring on that particular post was sticking out farther than the others. I don't know if it's the wrong size, but as noted it worked fine for a long time. That particular ring is blue, FWIW. So, maybe replace the O-rings on your posts? That's my plan. That is not true on all of them Tom. Some are identical except for the shape of the profile of the connector post themselves. Put the two side by side when you clean them and you'll see the difference. Keeping those O-rings lubricated with some keg lube makes a huge difference on how your connectors pop on and off too. I'll take your word for it, but I've never seen a gas post without the cuts. And that is saying something, I used to buy them by the hundreds, pressure test them, and sell them off. Any idea who the manufacturer is on the ones without the cuts? Totally agree on the keg lube, plus making sure the o-rings are in good shape. The o-rings have always been my issue when the QD sticks. I bought a bag of 100 so replacing them is no big deal. Sorry, No idea. Kegs were fished out of piles of scrap metal back in the '80's when you could buy 'em by the pound. I also use different color O-rings for each side. Black for beer, green for gas. Every time I see the title of this thread I think somebody is having trouble replying.